Place the sensor near the edge on a flat, stable surface. Position the sensor between 2 feet (0.6 m) and 6 feet (1.8 m) from the floor. Ideally, the sensor should be within 6 inches (15 cm) above or below your TV. Do not manually tilt the sensor; it adjusts automatically. Note In smaller rooms, try to position the sensor as close to 6 feet (1.8 m) as possible. One player: Stand back 6 feet (1.8 m). Two players: Stand back 8 feet (2.4 m). Make sure that the play space is at least 6 feet (1.8 m) wide, and not wider or longer than 12 feet (3.6 m). 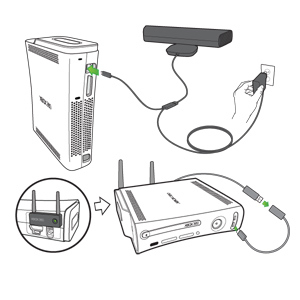 Disconnect any power plug cables attached to the Kinect sensor cable. The Xbox 360 E console will power the Kinect sensor directly. 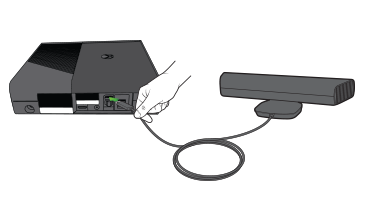 Disconnect any power plug cables attached to the Kinect sensor cable. The Xbox 360 S console will power the Kinect sensor directly. Plug one end of the cable into the USB port on the back of the console and the other end into an electrical outlet. If you have a wireless networking adapter, plug it into the USB port on the front of the console by using the supplied USB extension cable. Move all other USB accessories to USB ports on the front of the console. 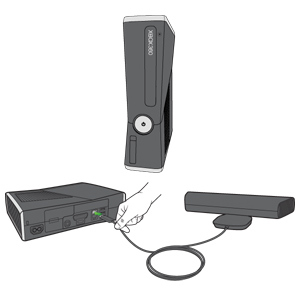 Note If you bought a Kinect sensor with an Xbox 360 E console or with an Xbox 360 S console, you'll need to purchase a power/USB cable if you want to connect the sensor to an Original Xbox 360 console. Xbox 360 Kinect accessories and replacement parts. Connect to Xbox Live (sign in using an Xbox Live gamertag). Insert a Kinect game disc and follow the on-screen instructions to update the console software. For other ways to update your console software, see How to get a new Xbox 360 update. 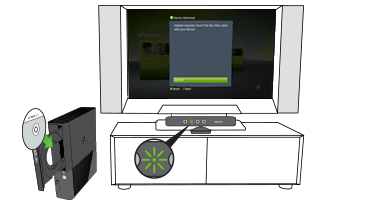 Once your console software is updated, follow the on-screen tutorial to help you become familiar with Kinect. When the Kinect sensor is active, a window appears in the lower-right corner of the dashboard. If you can see yourself in this window, then you can interact with Kinect. Now wave to Kinect and have fun! Would you like to contact Support regarding the "Kinect setup on Xbox 360" issue you were reading about or a different issue?